There are plenty of times in life where you find yourself having to clean up a mess you haven’t made. It isn’t even that uncommon for the mess to have been made by your parents, sometimes the older lot cause problems they just can’t fix, who hasn’t been asked to fix the Wi-Fi? Old people, am I right? This is what makes the story of Katamari Damacy Reroll so relatable; your father – The King of All Cosmos – has tasked you with recreating the stars because he accidentally wiped many of them out. To do this you have to take Katamaris of various sizes and roll them around until they gain enough size to be worthy of being a celestial body. See, relatable right? A veritable Big Mood. 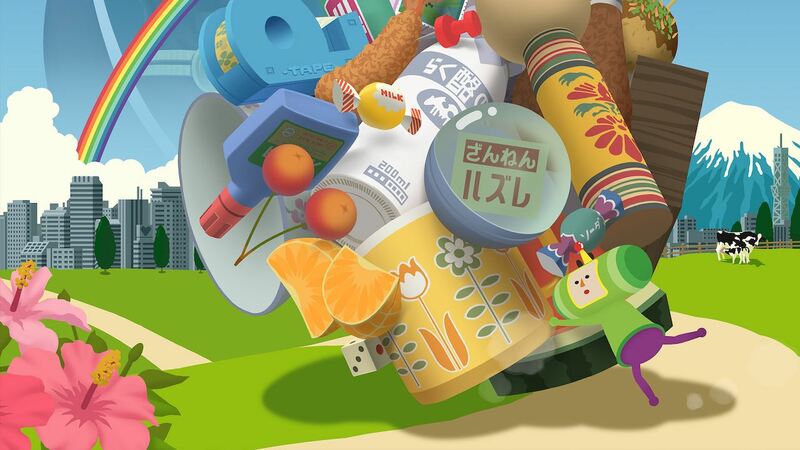 If all of this does, in fact, sound like utter nonsense and not relatable in the slightest, then congratulations and welcome to the incredibly irreverent world of Katamari. This is a remaster of a fourteen-year-old game in which very little has changed. For the most part this is no bad thing, the Katamari formula is such a weird creature that changing it just isn’t necessary, there are no other games doing this, so it doesn’t need to have changed to stand out. The aim of the game is always to meet whatever arbitrary size the King has set for you and hit it within the time limit he gives you. You see he has a short attention span and would rather be doing other things; things like telling you how short you are, how much better at rolling he is, and how much faster he would have been compared to you. If at this point you’re thinking “Well damn, now it’s relatable” then I want to take a second and say you’re awesome, you just keep on keeping on. Anyway, while you have your targets to hit, you’ll get a better response if you go above and beyond, the better you do the more likely it is you’ll earn praise instead of passive-aggressive put-downs. The best way to do this is to constantly size up everything, is your Katamari bigger than that bit of cheese? Well then roll that stinky stuff straight up. The more you add to your little primordial star the more you can add, as you get bigger you can take on bigger prey. The feeling of consuming everything gets more satisfying with each level. In the first level you will be bouncing off of cats like they are goliaths, but if you wait a few levels you’ll find yourself adding them to your giant collection like the weirdest scrapbook in existence. The progression is incredibly satisfying and replaying levels to try for a bigger final result is a lot of fun thanks in part to the great gameplay, and in part to the absolutely stellar soundtrack. The soundtrack is an absolutely incredible mix of different genres all of which are catchy ear-worms guaranteed to haunt you in your sleep… in a good way. Each level is accompanied by a song that feels sort of like it fits in a really strange way. The highlight is in the final level when you get an extremely upbeat version of the title song which goes on for nearly half an hour and still somehow remains immensely pleasing to the ears. The same can’t be said of the graphics, unfortunately. While the graphics are still hyper-stylised it is hard not to notice how little detail there is when you get to some of the larger levels. The game is no less enjoyable because of this, but it is the one area where it truly shows its age. The controls thankfully have two modern additions; motions controls, which are fun if it’s your thing, and the simple controls, which put movement on one stick and turning on the other. The default controls have you moving as though you have tank tracks, these are fun once you get used to them, but annoying if you don’t want to. The King of All Cosmos is still an incredibly funny character, he talks utter nonsense throughout and occasionally teaches you words from other languages. This immensely peculiar character goes alongside the side story brilliantly. The side story tells the tale of a family from Japan who are off to visit their Dad at work. The animation used in this is unique an lends itself well to the strange almost slapstick nature of the scenes it depicts.